To spend a few days with my grandmother. To give my new husband the grand tour and take him to all the spots that had significance in my life. I’ve discovered over the years that visiting that tiny town is like taking a trip back in time. Somehow I am immediately taken back to the early 80s. I suppose it’s because those were such pivotal years for me, but I think it’s also because my hometown is sort of stuck. Much of the town is exactly as it was during that decade of my life. It’s weird. The point is, the feeling lingers. I came home and began to infuse my current life with the pop culture of 20 years ago. The VH1 Classic/DVR combo in my living room lets me record and save hours worth of 80s videos every week. My YouTube “favorite videos” is now populated with the likes of Duran Duran, Cyndi Lauper and Pat Benatar. I’ve decided to begin a collection of 80s movies. I have a sudden need to read old issues of Seventeen. (I managed to find some from 1984 at a nearby library and I really did feel 13 again for the half hour or so I thumbed through them. I really did.) Luckily, I married someone who loves the 80s as much as I do–hometown trip or not. He is encouraging (enabling?) this six-laned highway trip down memory lane. Alas, though, there’s something missing. Now I can’t explain what waxing nostalgic has to do with buying old shoes, but I can tell you that I now need a pair of Kaepas. Remember the old Kaepas? With the two shoestrings in each shoe? I had a pair of low tops with the navy blue logo and a pair of high tops with the silver logo. I got them in middle school and I know I wore them through high school, but then… I have no idea what ever happened to them. 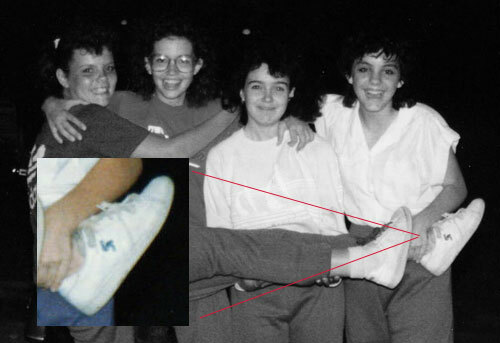 I still have my pink Chucks from 1983, so where did my Kaepas get off to? What’s weirder…everyone’s Kaepas seem to have gotten off to somewhere. I can’t find any mention of them anywhere. The official Kaepa website (yes, they still make shoes) has not a single mention. I’ve been haunting eBay daily and I’ve come up with nothing. Even those websites managed by avid vintage shoe lovers have no mention of the old Kaepa. There has to be at least one pair. Somewhere.